This framework is designed to provide black box tests for Android applications. This means that you test for expected outcomes instead of specific methods. It does require the application to be running in an emulator or device. Robotium builds off of the core Android integration testing libraries but provides an "extra" layer on top to make our testing easier with the Solo driver. Through the solo object, you can set values in input fields, click on buttons and get results from other UI components. Methods of JUnits Assert class can then be used to check those results. Let's take a look at writing blackbox integration tests with Robotium. First, you need to setup a "Test Project" much the same way as you would for the Android Testing Framework. Next, we need to add the robotium jar to our Test Project. Download the latest "robotium-solo-X.X.jar". You need to add the robotium JAR to the Libraries on the projects Build Path. The full source for this test can be found here. Compare this with the official Android testing and notice how much cleaner and clearer tests are with Robotium. 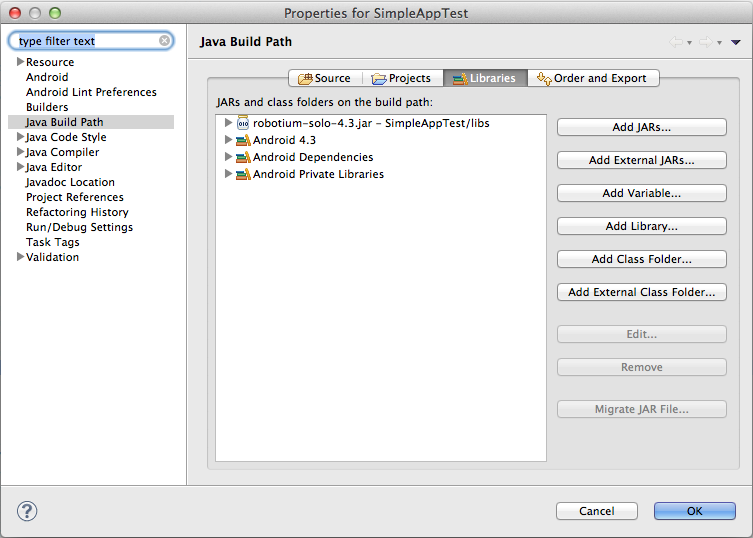 Now, in Eclipse we can right-click and select "Run As..." and then select "Android JUnit Test" and the tests will execute within the test runner. The tests should both pass and the "test bar" should be green. waitForActivity(SecondActivity.class, 2000) Waits for an Activity matching the specified name. waitForText(text, 2000) Waits for the specified text to appear. waitForView(R.id.view) Waits for a View matching the specified resource id. For more details, make sure to check the Robotium documentation. Most of Robotium examples rely on ActivityInstrumentationTestCase2, which is already marked as deprecated. Instead, Use ActivityTestRule using the Android Testing Support Library. Before we start using ActivityTestRule with Robotium testing, we need to need to change our existing configuration. Don't forget about defining your testInstrumentationRunner runner! Otherwise your tests won't run. Now we have all needed configuration to start test coding using Robotium. @RunWith() - describes which runner we would use in our test class.